Notification 2018. Last date for submission of application form for this Kanker Forest Circle Vanrakshak Jobs is 04-08-2018. Candidates who are qualified 10+2/HSC they are eligible for applying this Kanker Forest Circle Forest Guard Vacancies. Based on received applications eligible candidates will be called for written test and or physical tests after scrutiny of applications for this Forest Guard/Vanrakshak Jobs in Kanker Forest Circle. Complete details regarding this Vanrakshak Jobs of Kanker Forest Circle is given below. 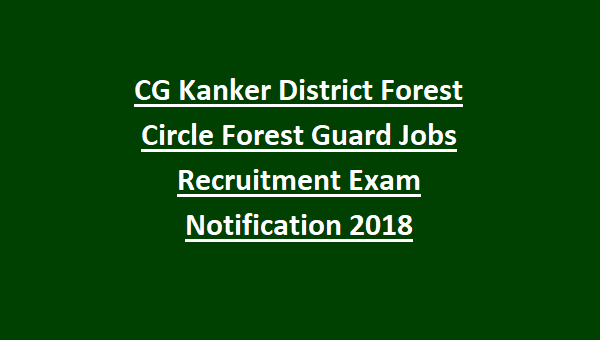 There are total 15 Forest Guard Jobs in this Kanker Forest Circle Recruitment 2018. Candidates must have qualified 10+2 from recognized board. Candidate should be Chhattisgarh Native. As on 01-01-2018 upper age limit for this Vanrakshak jobs is 35 years for general candidates. And for SC/ST candidates age relaxations will be applicable as per the CG Forest Dept Norms. For Female candidates-16 Km walking to be completed in 4 hours. Based on received application candidates written test and or Physical tests will be conducted. After verification of received applications candidates will be called for written exam or physical tests. 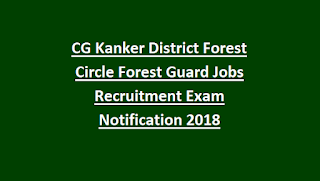 Interested and physical fitness having candidates may apply for this CG Kanker Forest Guard Jobs on or before 04-08-2018. Application form is available for download at www.cgforest.com. Attach the educational qualifications, caste certificate, native certificate and other required documents along with application for this Kanker Forest Circle forest guard jobs.